Today I will cover first step from my plan and will define Web Service interface for custom methods based on ADF BC Application Module. 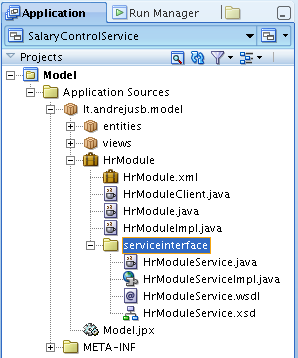 You can download sample application and deploy it in your standalone Oracle WebLogic environment - SalaryControlService.zip. Let's describe application structure, Web Service deployment and test process in Oracle Fusion 11g. You can find additional info on this topic in Oracle Fusion 11g Developer Guide - Integrating Service-Enabled Application Modules. Can you show the steps for jdeveloper 10g, i am using 10.1.3.3 as an IDE. First of all, I would like to convey my thanks for such nice postings which are of really great help. [04:48:57 PM] See server logs or server console for more details. Have you installed 11g PS2 Fusion on standalone WLS? Infact I installed it just a week ago. Then I have installed the ADF 1113 runtime to weblogic server. Is it a seperate patchset you are referring to? Also, for web services deployment, do I need to install SOA Suite to my weblogic server. If yes, could you kindly let me know the specific details of the patches to be applied. I was running it on standalone WebLogic instance with SOA. You should install SOA and test. On WLS 10.3.3, you will need to install SOA PS1 and then apply SOA PS2 patch. There are no specific details, just follow install instructions. After Installing PS2 to Weblogic server in Windows, I am still getting the error described above. Could you please help. What is the best approach, to call webservices? To generate Webservice interface through wsdl or creating webservice proxy through wsdl. Serializer initialization failed. Unable to define SDO data types. [EL Warning]: 2010-09-21 20:24:36.156--SDOUtil: Generated Type [ChangeSummary] conflicts with SDO specification naming rules for [ChangeSummary] and should be renamed. i am not able to figure out the root cause of this error please help me out thanks kiran. Thanks for the informative article. I am trying to expose one custom method within my application module as web service and i am getting this error while deploying in Jdeveloper 11.1.1.3 version. Not able to figure out the reason. Any help or pointer would be highly appreciated. I am getting this error while deploying in Jdeveloper 11.1.1.3. Any help.pointer would be highly appreciated. 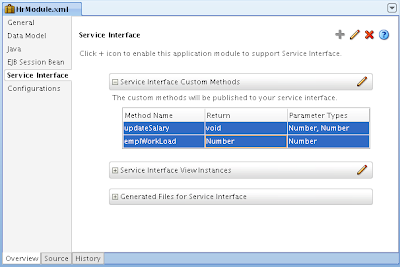 I have exposed one of the Application module method to Web Service (as you have explained). [03:15:15 PM] WARNING: Error while processing ejb-jar.xml for ejb module at "C:\Documents and Settings\sacggupt\Application Data\JDeveloper\system11.1.1.3.37.56.60\o.j2ee\drs\MicroApplications\VendorEJB.jar". 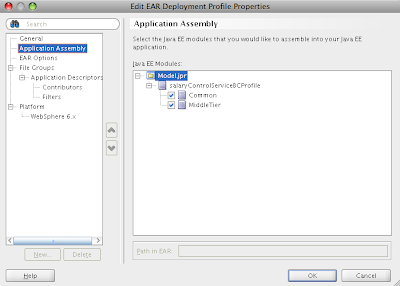 [03:15:15 PM] INFO: Unable to load annotation javax.interceptor.Interceptors for parsing. The annotation is ignored. Failed to register the web service Config MBeans for application: MicroApplications endpoint: MicroAppTemplate-Vendor-context-root the error is: oracle.as.jmx.framework.util.MissingConfigurationFileException: The configuration at URI "WEB-INF\oracle-webservices.xml" cannot be loaded. [03:15:33 PM] Application Deployed Successfully. Run startup time: 23625 ms. I will need to test it on latest WLS, will inform you then, if I will be able to reproduce. If we expose an application module as webservices, will this web services have the same authentication that we have defined for the application? ADF Security will not be applied to WS, you need to secure WS separately. Ok Nice, then we need Oracle web services manager to define the security policy for AppModule Webservices(according to documentation B31974-05 section 11.2.13). So need to license Oracle SOA suite cos webservices manager comes under SOA suite. Thanks for the awesome tutorials! Unfortunately I am running into an error. This occurs when I 'Deploy to Ear' so I don't think its related to my WLS. Do you know what could be causing this? Yes, it might be deployment configuration files changes with new release. Just follow steps and recreate your sample app. The error is because you're selection _both_ Common _and_ Middle Tier. For server-side deployment of the service you only need Middle Tier, which is the only one selected by default. Do you know how can I override default base operations on Application Module Interfaces (eg create) I want doing some operation after that I have posted my record . How can I write Custom operation by using built in create(SDO Objact) functionality ? 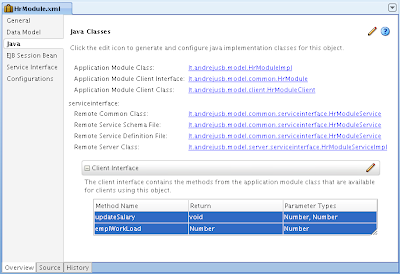 Is there a way to access the method's in service interface directly from an java class. like in a managed bean if the projects (View an Model) are in same application. Yes, you can generate Web Service proxy. I had a similar implementation but I generated asynchronous methods in the service interface. When I checked the deployed application in the weblogic console, I found two MDBs generated automatically to handle the asynchronous request and response in my application. I am trying to set some properties to these MDBs like initial-beans-in-free-pool etc. 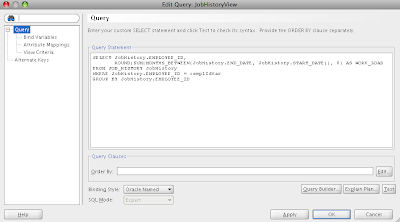 in the weblogic-ejb-jar.xml deployment file but to no avail. Can you please give me any information on how to customize number of initial beans for these MDBs? If not how this can be achieved ? Yes, it can be transaction enabled, because its based on Application Module. Can you tell me a way to do the same using RESTful web service to give the response as JASON object. I created an proxy for webservice which is secured. Is there any way to pass username/Password while invoking the web service through proxy? First of all, thanks for the simple but direct example, it really helps. it only support primitive Java type, oracle.jbo.server.ViewRowImpl, java.util.List, oracle.jbo.AttributeList, or java.util.List. But do you know how to get around this issue? Thanks and any help is appreciated! "java.lang.Exception: oracle.sysman.emSDK.webservices.wsdlapi.SoapTestException: oracle.fabric.common.FabricInvocationException: Unable to access the following endpoint(s): http://xxxxxxxxxxxxxxxxxxxxxxxxxxxxxxx/yyyyyyy.svc ". 1.The Web Service that we are trying to consume is built on Microsoft Dynamics AX Framework and is using Windows Authentication and we are using Oracle Soa Suite 11g(11.1.1.5) to access it. 2.The Web Serice is Hosted on IIS server 7.0 . The Soa server and IIS server both are on the same domain(Also need to confirm that is there any need to pass credentials while consuming Web Services when both the servers are on same domain??).
" 401 - Unauthorized: Access is denied due to invalid credentials. 4.We can even access the WSDL from the browser. Please let me know I going in right direction. I am using jDeveloper 11.1.1.5. Does this get the AM from the ADF AM pool or does it instantiate a new AM instance each time? Also curious how to set up security. 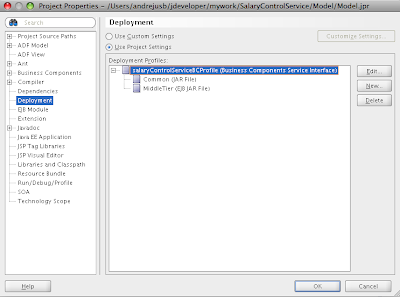 I got a stand alone example to work but it completely broke my ADF application when I tried to add a service enabled application module to it. It got class loader errors trying to load existing app modules. When you define WS for AM, it creates new AM configuration, it is using AM pool as well. For secured WS you can check this post - http://andrejusb.blogspot.com/2012/11/adf-mobile-secured-web-service-access.html This is about ADF Mobile, but Web Service part is about secured AM Web Service. Hi Andrejus, thanks! but I have a problem, I've continued your steps but when I write wsdl in a browser i get the message "WSDLException: faultCode=OTHER_ERROR: A policy advertisement error occurred while retrieving the WSDL associated with the provider: JDEServicesAMServiceSoapHttpPort: oracle.fabric.common.AdvertisementException: Advertisement Engine failure"
what is it the problem? If I run on local I can test webservices without problem.